Attaching a pump to your rainwater tank will ensure you have enough water pressure for your needs and also required for internal use of the water tank. We sell a range of garden, household pumps, pressure pumps and fire fighting pumps. Listed are a range of Quality Reefe & Davey Pumps with a 2 year warranty. 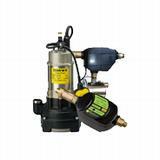 Contact us for a price and further information on any pumps for your rainwater tank. A submersible pump which is installed inside your water tank. Quiet running and out of site. ​The RM1500 is an automatic hydraulically operated mains to rainwater changeover valve. It is ideal for rainwater harvesting - switches from mains to tank whenever tank water is available and automatically defaults to mains in the event of a power or pump failure. This unique valve comes with dual 1” outlets, giving the user flexibility in both domestic and commercial applications. This product is best suited to be used with pumps with an auto-restart function. These come together with RPS036 or PRJ062 pressure pump. A rainbank allows households to replace up to 40% of their drinking quality water with rainwater. Rainbank does the thinking for you by automatically switching water source from the domestic mains to the rainwater supply stored in the tank whenever a toilet is flushed or a washing machine used. Rainbank automatically supplies mains water as backup. Rainbank only operates the pump to pressurise the rainwater when required so energy costs are saved.